Here you go ! 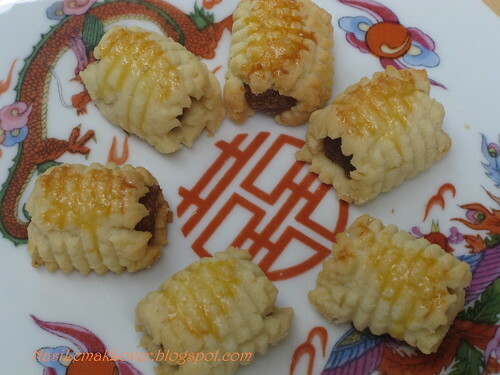 my own way of pineapple rolls ,my Malay friend so kind shared her secret recipe to me, and I have been using this recipe for many years. There is an interesting ingredient added, I have not seen anyone add this ingredient, check it out below. This pineapple roll is buttery and melt-in-mouth. 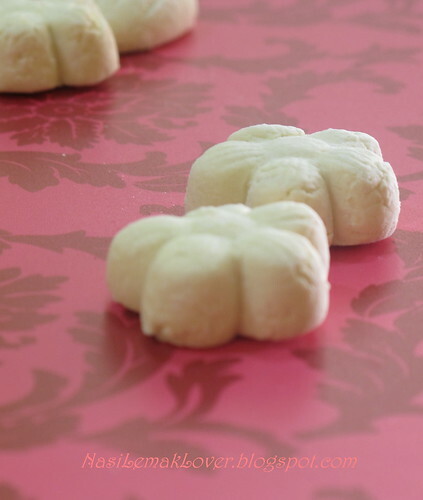 -I just use a very cheap Nastar mould, but I feel this mould is so easy to handle, just use thumb to push out the pastry. 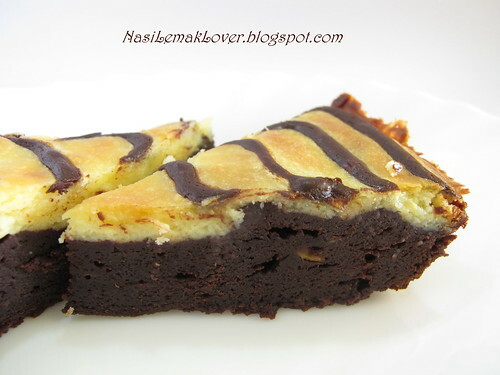 ** The interesting ingredient is Condensed Milk ( sweet milk/ susu pekat manis), trust me, you will not have a sweet pastry, but instead the pastry is buttery and soft. 2. Add in egg yolk one at a time, and beat until fluffy. 3. 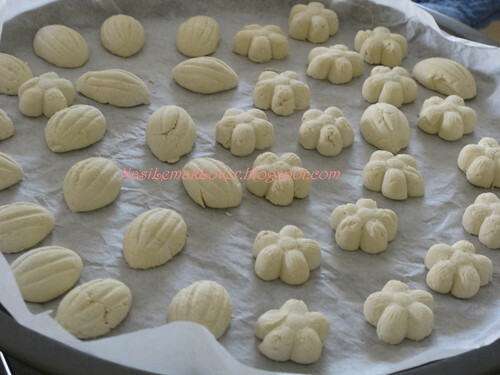 Mix in flour, mix till become a firm and non-stick dough. 4. Put mixture into a Nastar mould and press out into strips about 5-6cm long. 5. 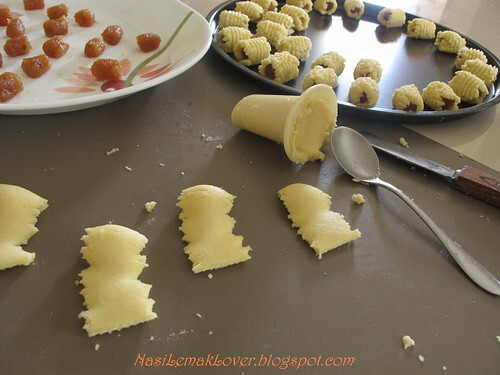 Place pineapple jam filling on the edge of a strip and make a small elongated roll. 6. Cut off excess dough, brush with egg glaze. 7. Bake in preheated oven at 180c for 13-15mins or till golden brown. 8. Cool on wire racks before storing. 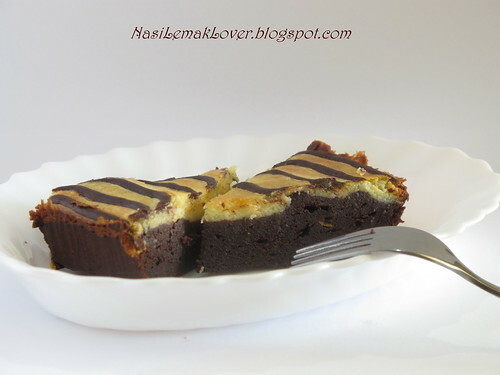 I found a good recipe of cream cheese brownie, simple and yummy !! 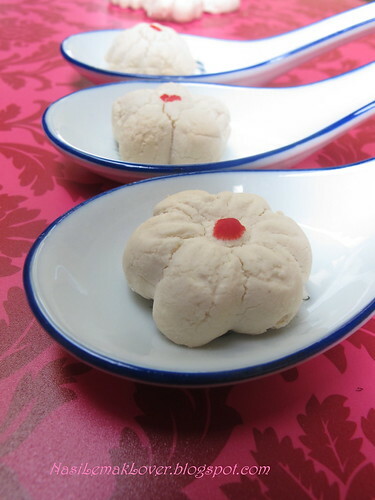 Recipe adapted from Moon 月亮 , Thanks Moon for kind sharing !! 3. Fill the 1tbsp of brownie mixture into a piping bag, and follow to Moon’s step here to decorate. 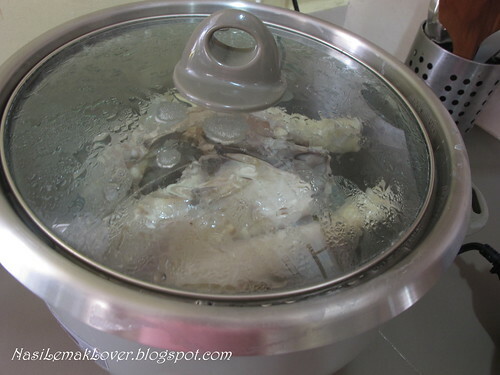 This was my lazy way of preparing salted chicken, use rice cooker, Easy and Delicious ! 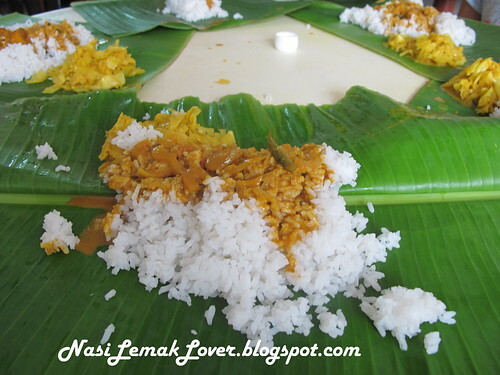 -Ready to serve, Yummy Yummy !! 1. Soak Tong Kuai herb in Tiew Heng wine for 30mins. 2. 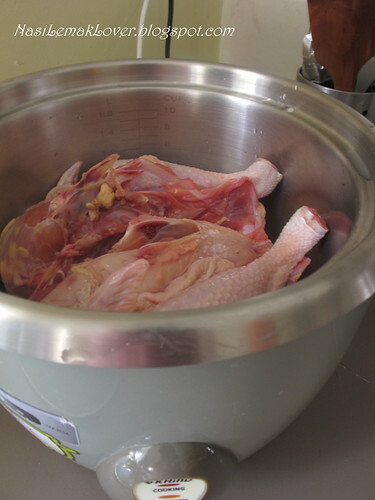 Rub salt over the whole chicken, and Tong Kuai and wine, set aside 2hours. 3. 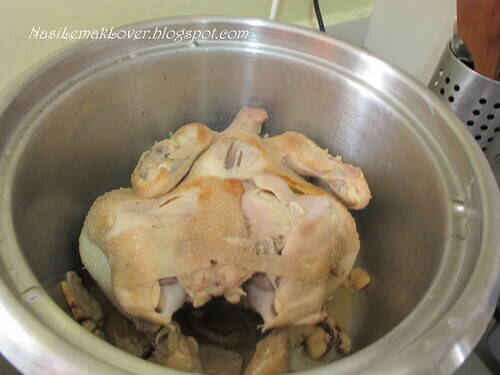 Place chicken in a rice cooker and also the mixture, and cook. 4. Cook for 30mins or till cooked. 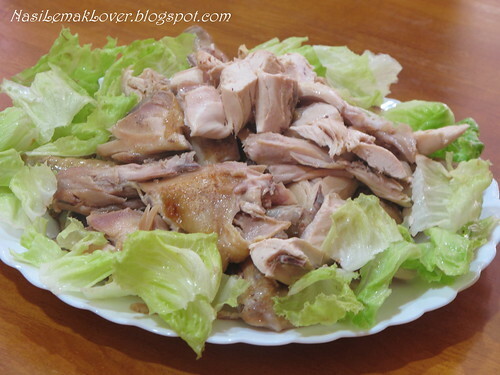 My note: Once cooked, it came out some juices, after cut the chicken into small pieces, either you can pour juices on chicken or just add to white rice, yummy!! After waited 4 days 3 nights, today I'm exciting to bake the 2nd batch of Kuih Bangkit( failed on 1st batch, here), finally the resulted was so good, the Kuih Bangkit is simply crispy and melt-in-mouth !! I went through all your wonderful recommendations, took what I feel workable, and came out with my recipe that worked for me. Recipe adapted from Jane, but I altered the ingredients measurement as I have done stir-fried flour before her post. Thanks to Jane for kind sharing !! 1. Stir fry tapioca flour and sago flour with pandan leaves in a clean wok for 75mins(low flame) until flour very light and slightly turned yellow, and pandan leaves turned crispy. The final weight I got was 210g. 2. 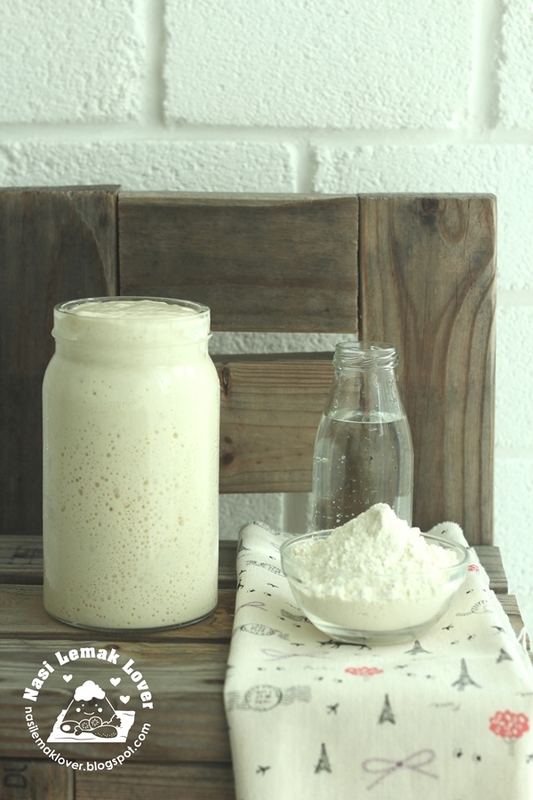 Cool flour for several days (if you intend to keep more than 3 weeks, then store in air-tight container and keep inside the fridge) . 3. Whisk egg yolk until creamy, add in icing sugar and half coconut milk, whisk till combine. 4. In a mixing bowl, sift in tapioca+sago flour, add in egg mixture. 5. Slowly add in(little by little)the balance coconut milk into mixture, mixing by hand till mixture clings together to form a stiff dough, smooth and pliable(neither too wet nor dry, I knead about 5mins). 6. Dust a Bangkit mould with extra flour, press dough gently into mould. Trim excess dough. Tap gently on hard surface to remove dough. Repeat. 7. Bake in preheated oven at 160c for 25mins. 1. 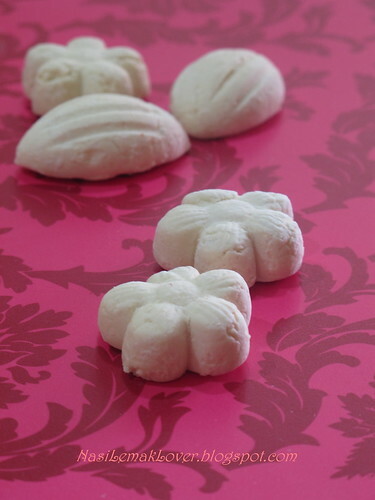 I feel a bit tough to use mould to shape, advise you to use the cookie cutter for easy shaping. Personally I like the traditional mould. 2. 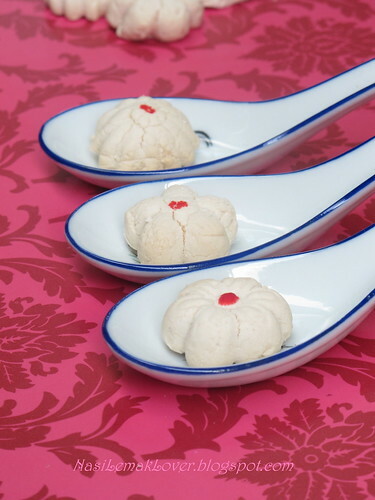 Use toothpick to clean the excess dough stick on the mould. 3. Set aside extra coconut milk to add in dough when dough turned dry, and extra flour for dusting. 4. Do not try to shorten the stir fry time, if you did, you will have a cookie has raw flour smell..
- I did few with Tiger face, look ugly ho? 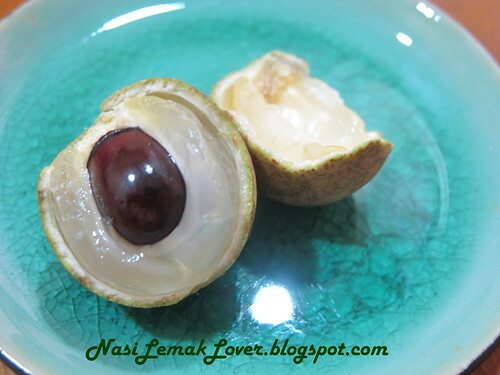 Mata Kuching(Cat's eyes) plant in my garden, very common fruit in Malaysia, read here if you don't know this fruit. 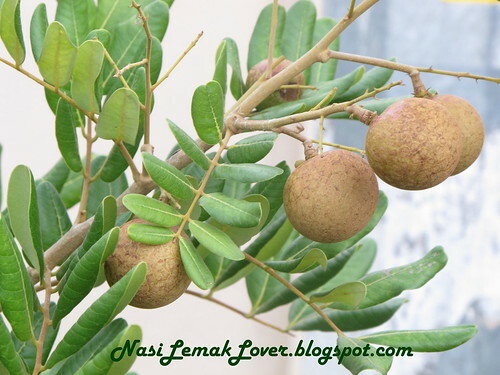 My husband's plant this tree for two reasons, 1-shelter of his car which parking outside the house, 2-for eating. But he managed to achieve no 2!! The tree is too small to achieve no 1. 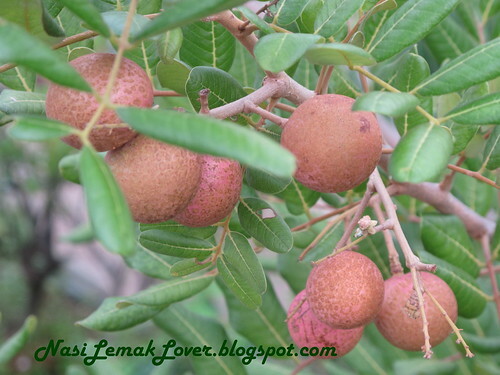 -the flesh is very juicy and sweet, furthermore this is organic!! 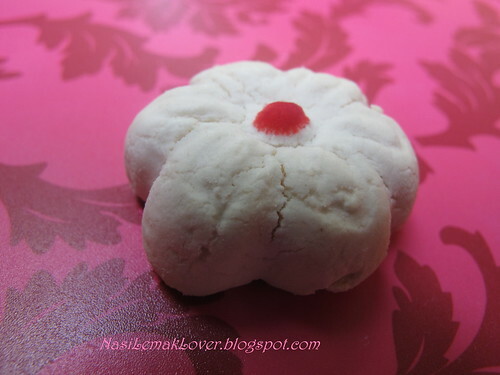 My kids love “Kuih Bangkit” - a melt in the mouth cookie made with tapioca flour and coconut milk. 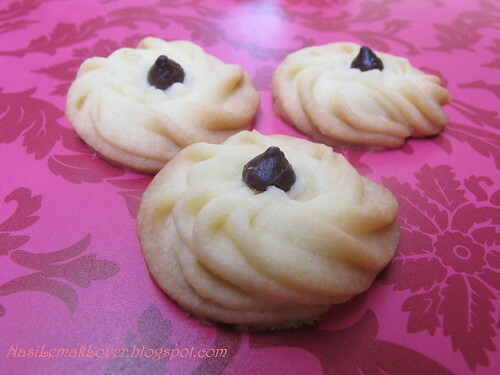 It is one of the must have cookies during Chinese New Year in Malaysia. 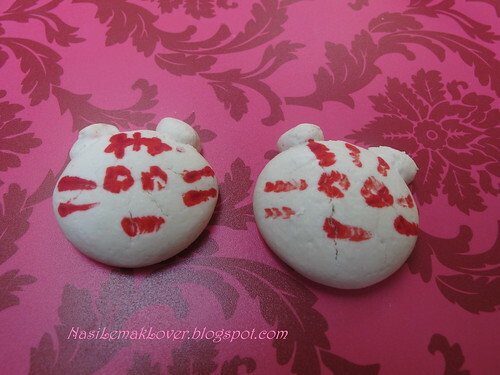 So this year, I give myself a challenge to this difficult to do Chinese New Year cookie. I don’t have anyone to refer, even my Malay friend also don’t know how to do. No choice, I searched in Google and food magazines, found few recipes, at the end I picked the recipe from the food magazine which look workable. Kneading process worked ok, but when comes to making shape, it was so difficult, especially to remove from the mould. When the 1st batch done, my kids and hubby tried, they didn’t enjoy eating them as it is hard and have kind of raw flour smell. 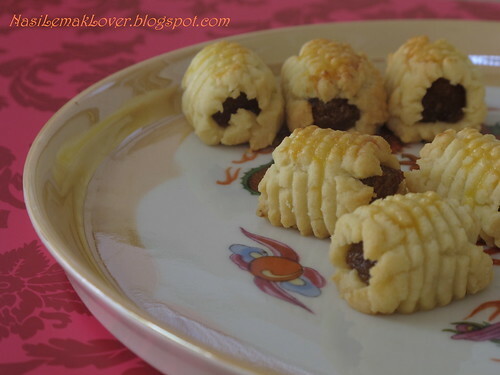 Thinking to drop the idea to making my own “Kuih Bangkit”, but after my conversation with the bakery ingredients shop worker this morning and saw this link sent by Bakeling, I changed my mind. Me : Do you know how to make Kuih Bangkit? Shop worker : I don’t know, but I know what ingredients, my clients told me. Me: I made yesterday, but my kuih bangkit got kind of raw flour smell and hard. Shop worker : How long did you fry the tapioca flour? Shop worker: Adoi, only 20mins, Hahaha, you have to stir fry very long hour until the tapioca flour very very light and like it can “Fly”.That means your tapioca flour is not cooked enough, that’s why got kind of raw flour smell. And you have to store it for 2-3 days to let it cool completely . Me: Ha !! need to fry so long!! and I use the flour immediately when it turn cooled. 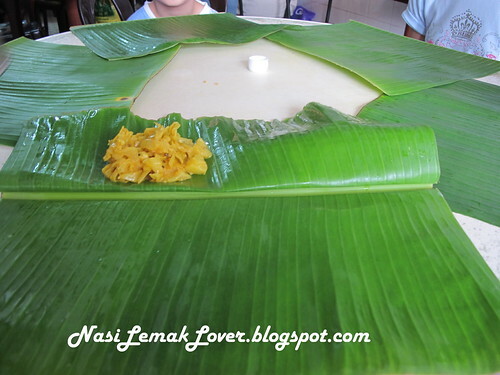 I know some (from internet) peoples use oven to bake it, this way can kah? Shop worker: Not advisable to use oven, the flour will fly everywhere inside the oven, later your oven will be broken, follow traditional way, fry it with wok !! Me: ok, ok, will try. I also heard some people add in margarine? Shop worker: I don’t think so, but i heard from client they mix it with sago flour. Me: Really, how much sago flour to add in? Shop worker: I don’t’ know, maybe half or less. Me: Ok, give me one packet of sago flour. I give myself a 2nd trial , I will fry flour today, and cool flour for 2-3 days, let you know the result next week. If still failed, then I will just buy from outside, but I don't really want to do this!! 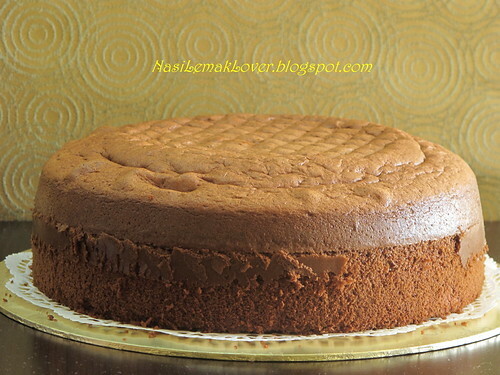 If you have a good, tried-and-tested recipe, appreciate if you could share it with me! 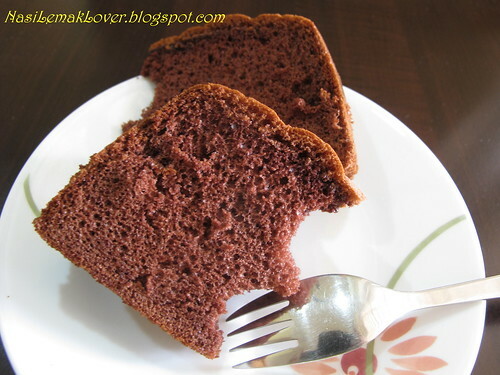 After i success baked basic sponge cake(cocoa), I prefer to use the same recipe to bake other flavour of sponge cake. This time, i tried with green tea. 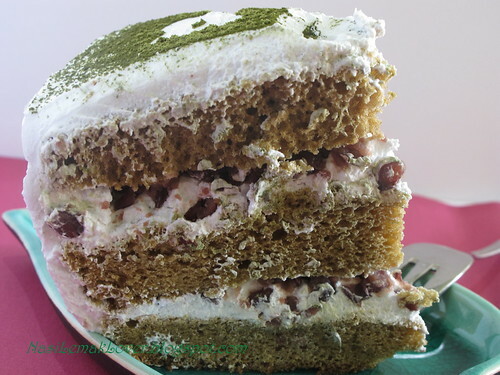 -Not sure why I can not have nice green colour, because I'm not using the special green tea powder for baking purposes or have to drop some green colouring ?Please let me know if you know the reason, much appreciate. 1. 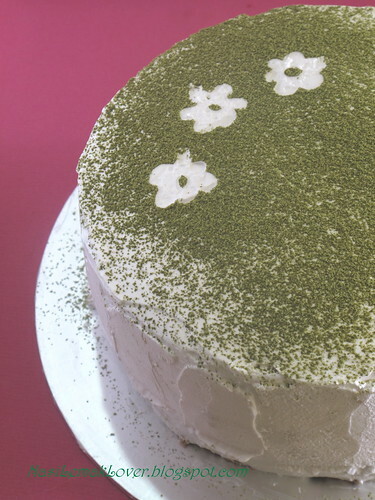 Mix green tea powder with milk until it become green tea paste, set aside. 2. Beat whole egg + egg yolk, sugar and salt on HIGH speed till foamy. 3. Add in syrup and continue beat on MEDIUM speed till double in volume and ribbon-like. 4. Sift cake flour and baking soda, beat on LOW speed till mix well (about 20-30 beats). 5. Add in corn oil, and mix well. 6. With a spatula, take 1/3 of the batter and mix it with no (1) using hand whisk. Fill in this mixture with the remaining batter and combine well with spatula. 7. Pour batter in a 7” round pan and bake 25-30mins at 180c. 8. 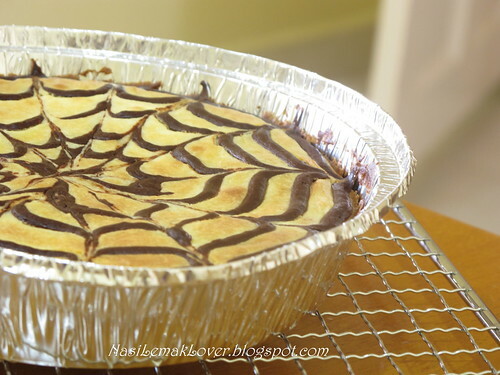 Remove from the oven and invert the pan immediately. Let cool completely before unmould. 9. 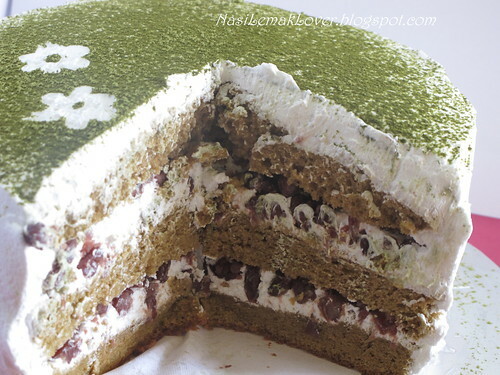 Slice the cake horizontally into 3 layers. Place one of the cake layers cut-side down on a cake plate. 10. Spread the whipped cream over the layer. And follow by red bean paste to cover the whole layer. 11. Repeat step 10 for the second cake layer. Top with the third layer. Old Chinese peoples believe if you see mango (I think they mean unripe mango), if you are not salivating, then you will change to ugly look !! I heard this when I was young, did you hear this kind of old believe before? 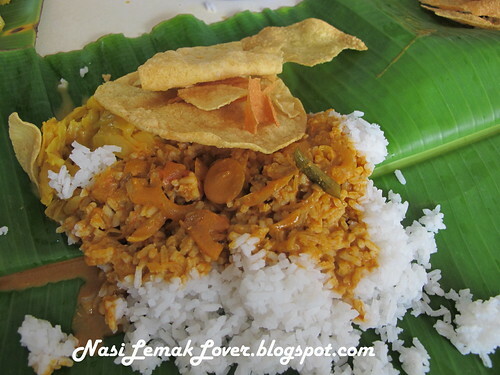 -Are you salivating after see this photo? If not, better pretend you are, otherwise you will change to ugly, Hahaha!! 1. 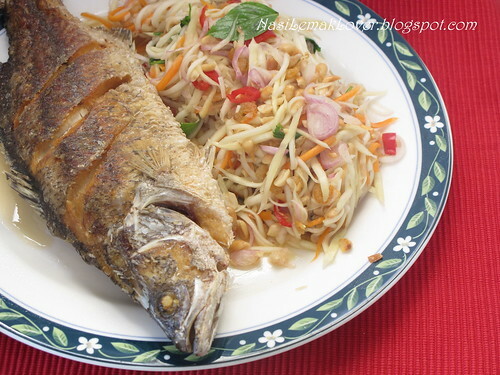 Heat oil in a wok to deep fry the fish until golden and crispy. 2. 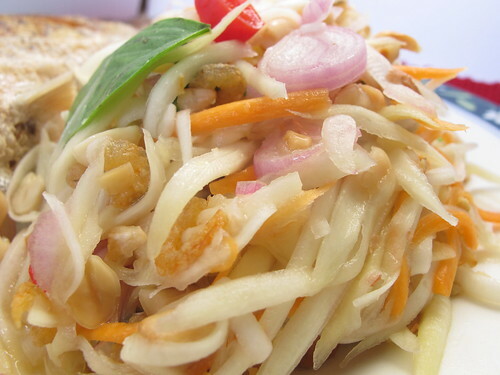 In a mixing bowl, combine all salad ingredients and toss well with the dressing ingredients. 4. 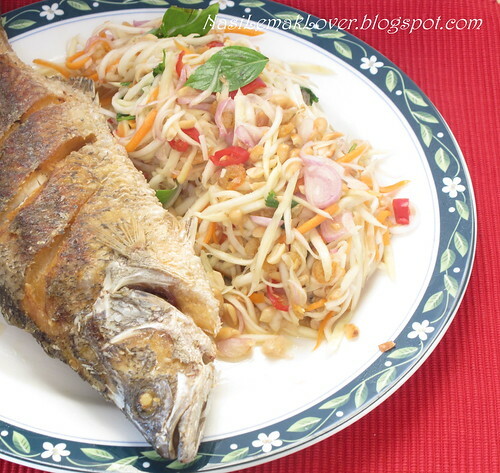 Place the fried fish on a serving plate and top with mango salad. Enjoy !! 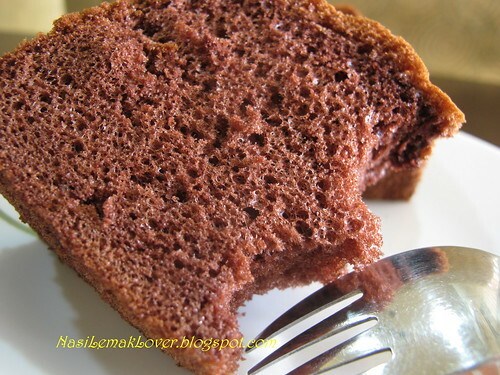 Finally, i found a sponge cake recipe which is really good, moist and spongy, and I can use this as a cake base for Birthday cake. 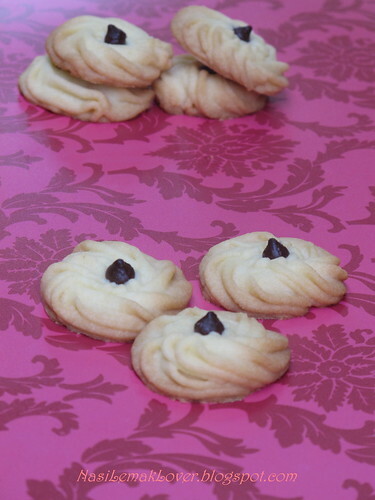 Recipe adapted from FoodHouse8 (she is my favourite baking master !! 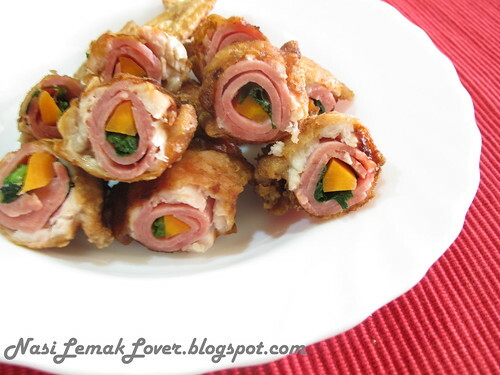 ), if you know Chinese, the video is self-explanatory, otherwise check below recipe. 1. Heat up corn oil (low flame), turn off flame, add in cocoa powder and mix well, set aside. 3. Add in glucose and continue beat on MEDIUM speed till double in volume and ribbon-like. 4. Sift cake flour and baking soda, beat on LOW speed till mix well. 5. With a spatula, take 1/3 of the batter and mix it with no (1), fill in this mixture with the remaining batter, combine well. Last add in milk and mix well. 6. Pour batter in a 9” round pan and bake for 35mins at 180c. ** This sponge cake still very moist even keep till the next day, and no need egg separation, so much easy to bake, do try out, good one !! 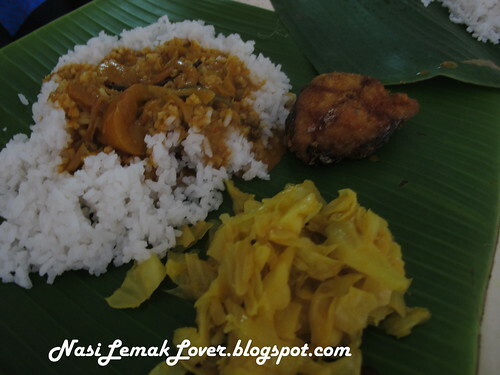 If we think to take banana leaf rice, we will first think of Yap Kee, Klang. This shop is very popular to local especially older generation and it has been there easily for 20-30 years !! This shop really truly reflect One Malaysia spirit, Chinese taukeh (owner), Indian cook and customers are Malay, Chinese, and Indian. -This shop is very packed during lunch. 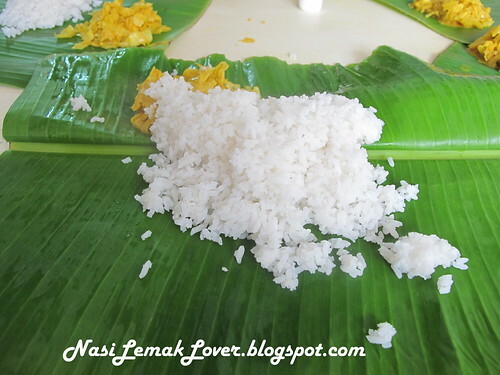 -Then followed by white rice. 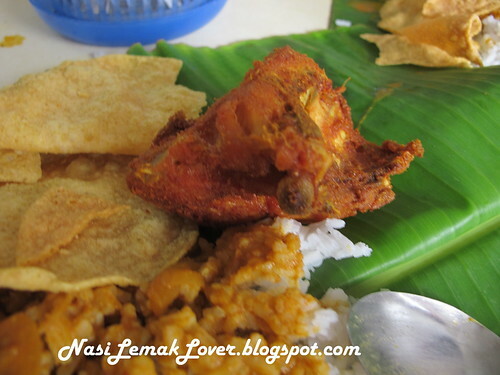 -Or to have a very nice piece of fried chicken with curry powder. They also have very nice mutton curry, we didn't order this time. 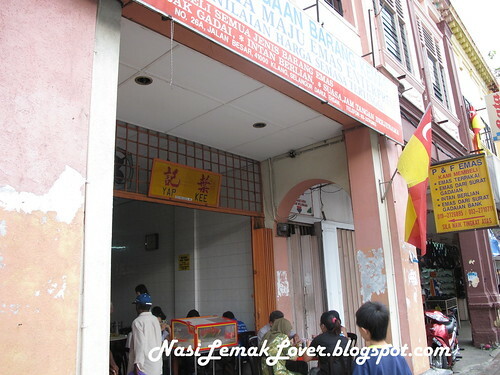 I don't have the exact address of this shop, the shop is located opposite the famous under the bridge bak kut teh, Seng Huat Bak kut Teh. And they only operate during lunch time. 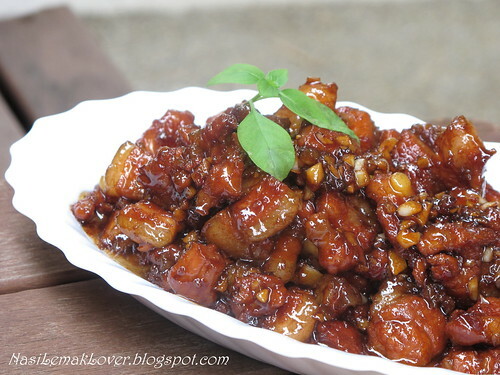 After bought a kg of pork belly, thinking to cook steamed glutinous rice, but I changed my mind after see this dish in Ohbin's house, it made me drooling by just look at the picture. 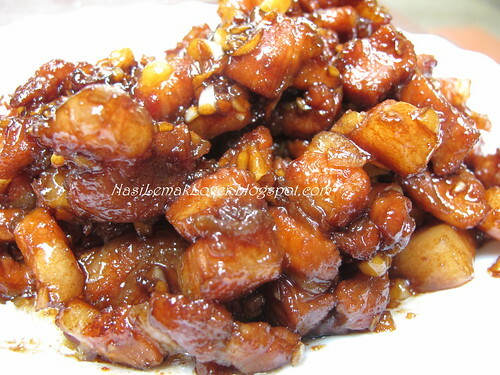 So here is Ohbin's 4321 Fragrant Garlic Belly Pork, you must try this, it is super yummy!! Recipe adapted from Obhin, she has plenty of good dishes, find out more in her blog. Thank you to Ohbin for kind sharing. 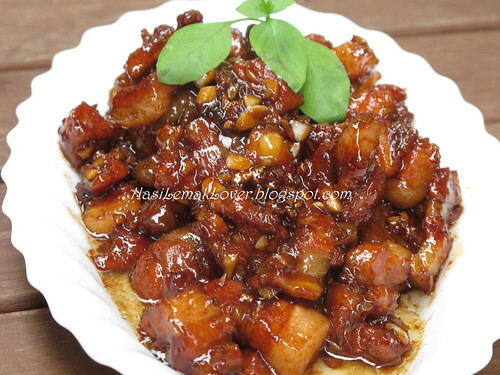 My tip- I slightly changed the steps of preparing this dish, as I remembered my mum taught me to make caramel when cooking pork dish as this process will make the pork dish more fragrant..
2. Add in pork meat, mix well. 3. Then add in water, vinegar and wine and cook over low flame for 40mins or more. 4. Once you see little water left, add in chopped garlic, turn to medium flame, and cook till sauce became thicken. 5. Dish out (leave the excess oil). 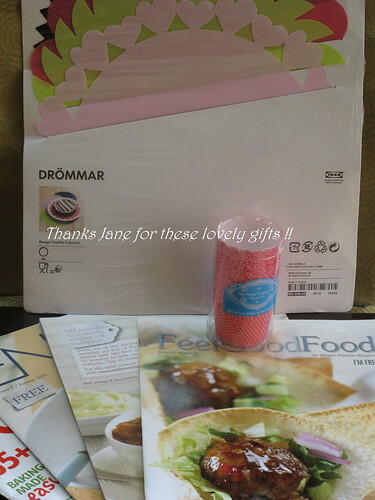 On the Christmas eve day, i was surprised to receive a parcel from Pos Laju, inside was some gifts given by Jane. She brought these gifts all the way from Australia. Earlier she requested me to give my house address to her as she would like to send me some recipe books (she said these recipes are free), but she is so nice to also included some nice paper cup cakes and Cake-doilies for me. I just like to say BIG Thank you to Jane !! 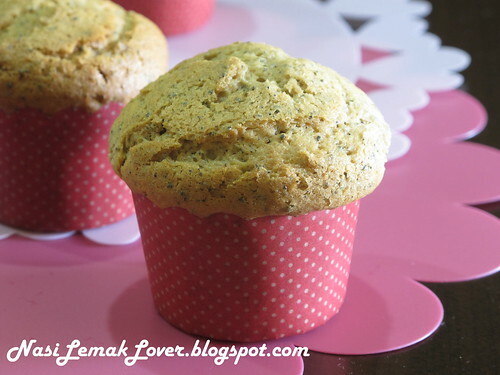 -So I quickly use this lovely paper cup cakes to bake new recipe- milk tea muffins. 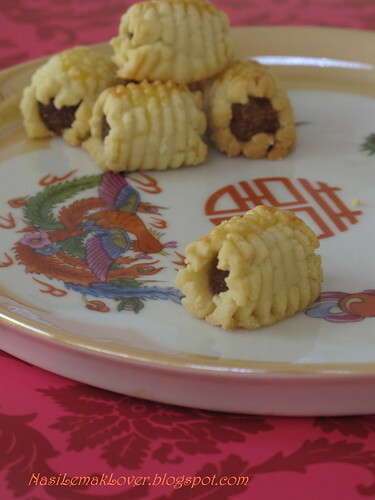 Recipe adapted from 幸福の我们 (YiYimummy) ,original recipe by 孟老师的《100道小蛋糕》. Thanks to 仪仪妈咪 for kind sharing !! 1. Remove tea leaves from the bag, mix it with milk, soak for 10mins. 2. Whisk egg with sugar till fluffy, then mix in corn oil. 4. Sift cake flour and soda in egg mixture, combine well. 5. Fill batter in paper cups, bake at pre-heat oven at 180c for 25mins. 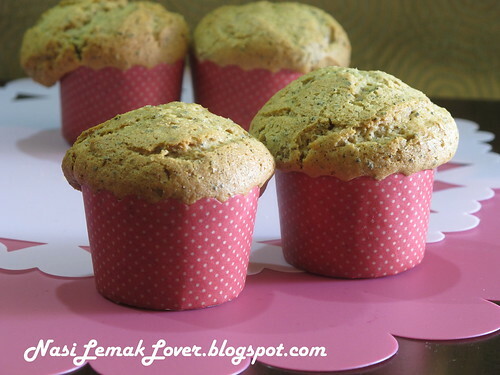 ** I feel this muffin turned quite dry when I keep it overnight, so try to consume in the same day. 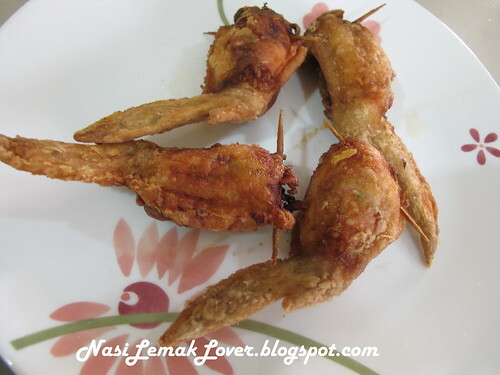 We love this fried stuffed chicken wings which served at Baby seafood restaurant. 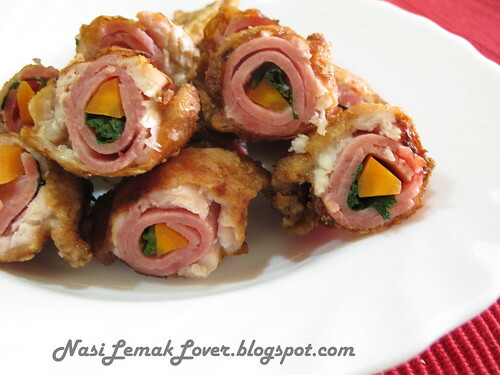 I imitated this at home recently..
1. roll the chicken ham, carrot and coriander, and stuff it inside the chicken wing. 2. tie up by toothpick, season with light soy sauce,salt and pepper, set aside for 1hour.